A Saudi Billionaire's Detention Is Making Some Investors Nervous : Parallels Prince Alwaleed bin Talal was swept up in early November with more than 200 other Saudi businessmen and princes in a massive anti-corruption campaign spearheaded by Crown Prince Mohammed bin Salman. Saudi Prince Alwaleed bin Talal waves during an official visit to the West Bank city of Ramallah in 2014. The Saudi billionaire was detained last month in Riyadh and has not been seen since. Alwaleed is the highest-profile Saudi figure detained in the November sweep. More than just a member of Saudi Arabia's ruling family, he is a businessman believed to be worth about $20 billion, with significant investments in many Western companies, including Citigroup, Twitter and Time Warner. He owns enormous yachts and a Boeing 747 with a gold-trimmed interior. But detaining a key international financial player of Alwaleed's stature could harm potential investment in Saudi Arabia, some analysts say. "He enjoys his reputation both as an international tycoon and for his relationships with international business figures," says Henderson. "And frankly, he's flamboyant ... and loves to have his photograph taken." But Henderson says Alwaleed is also known for philanthropic works and has worked with Microsoft co-founder Bill Gates on a number of business and humanitarian projects, including vaccination drives. Henderson says the 62-year-old prince is a good example of modern Saudi Arabia — progressive and worldly — and "all of a sudden, he falls from favor." There's been no sign of Alwaleed since he was detained as part of the anti-corruption crackdown. Allison Wood, a Middle East consultant for Control Risks, says many investors and analysts are trying to figure out what might happen to him. 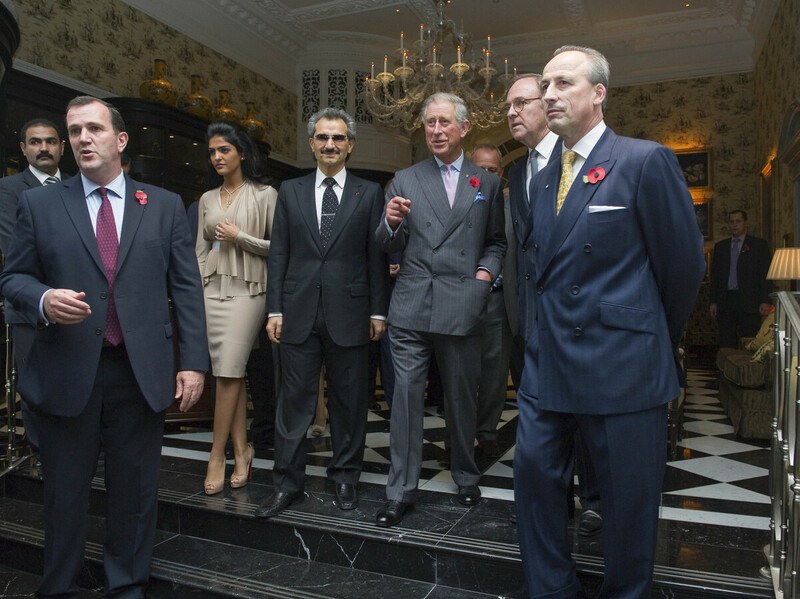 Alwaleed's company, Kingdom Holdings, offers no clues, she says. 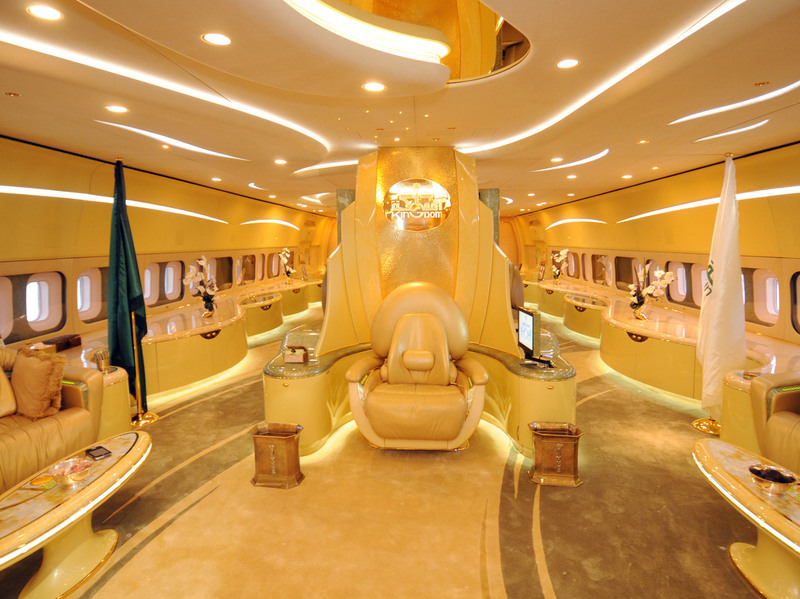 The interior of Saudi Prince Alwaleed bin Talal's private Boeing 747 is trimmed with gold. "The official reaction from Kingdom Holdings has been to say that it's broadly business as normal," she says. "I don't know that a lot of people really believe that, necessarily, given that its largest shareholder has not been heard from for several weeks at this point." Shares in Kingdom Holdings dropped by 10 percent after Alwaleed's arrest. It's unclear why Alwaleed was detained. In response to an NPR query about his case, Fatimah Baeshen, a spokesperson at the Saudi Embassy in Washington, D.C., said the embassy "does not have information on specific individuals, due to Saudi privacy laws." Alwaleed may have gotten on the wrong side of Salman, who is trying to reform the economy and needs buy-in from the business community, says Ayham Kamel, a Middle East specialist with the Eurasia Group. Kamel says Alwaleed has not rallied the domestic or international business community to invest in ventures sponsored by the crown prince, such as Neom, an ambitious new economic zone and business hub envisioned to be bigger than Dubai. "In the last few months, although he has been supportive of Crown Prince Mohammed bin Salman's reform efforts, he has not put money behind where his mouth is," he says. Kamel doesn't believe the detentions will deter many international investors. "Part of what will make Saudi Arabia more viable over the long term is ending the corruption networks that connect the ruling family with business elites," he says. But the Washington Institute's Henderson believes the detentions send a clear signal to Saudi and international investors. Prince Alwaleed Bin Talal (fourth from left) attends the reopening of London's Savoy Hotel in 2010 with Prince Charles. "The crown prince is clearly not a person you want to get on the wrong side of. ... It would be bad for your business and might well be bad for you," he says. Wood, from Control Risks, says there's been no apparent transparency or due process in the detentions. But no matter the reason Alwaleed was picked up, she says, his continued absence is making some foreign investors nervous. "Investors are certainly worried about where Alwaleed is," she says. "It's certainly introduced a great deal of uncertainty for companies that have associations with him." Some detainees have been released after paying a settlement, including Prince Miteb bin Abdullah — once seen as a contender to the throne — who reportedly paid $1 billion for his freedom. The government public prosecutor says 159 are still being held. The Eurasia Group's Kamel says Alwaleed certainly has the money to get out of his gilded prison, but may be digging in his heels. "I think it's to make a point, and also to reach a deal that works for him as well," he says. Until then, associates and business partners of Alwaleed can only guess about his fate.